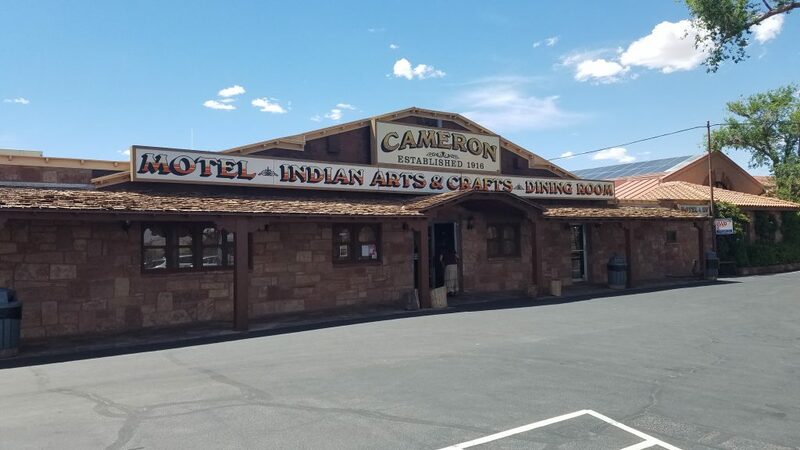 FEATURE – Along the roadside of U.S. Highway 89 in the high desert plains north of Flagstaff, Arizona, drivers will find numerous stands along the roadside where Navajo artisans sell their wares to passersby and the granddaddy of them all is the Cameron Trading Post. 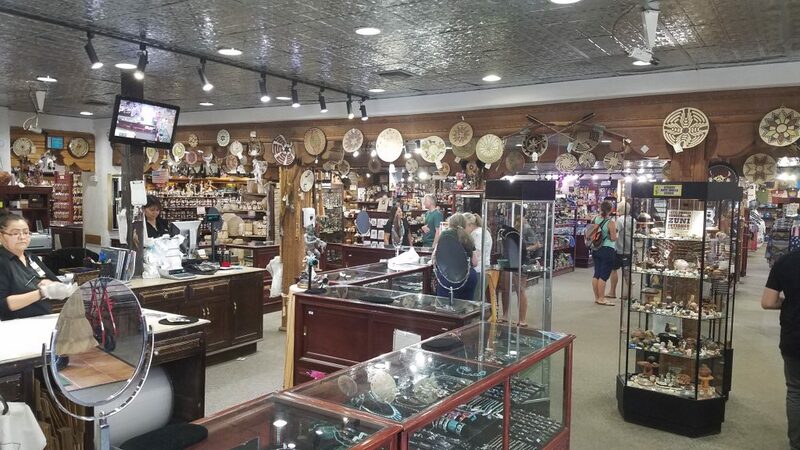 The Cameron is where visitors will find the largest selection of rugs, jewelry, dolls and practically any Native American art one can imagine. It proudly displays in its windows an insignia noting it’s been a fixture on the south side of the Little Colorado River since 1916. The region now known as Cameron has been a crossroads of trails and roads for centuries. Today its geography is most favorable, serving as the gateway to the South Rim of Grand Canyon National Park. The Grand Canyon, not surprisingly, is on the Top 10 list of most-visited national parks in the nation. 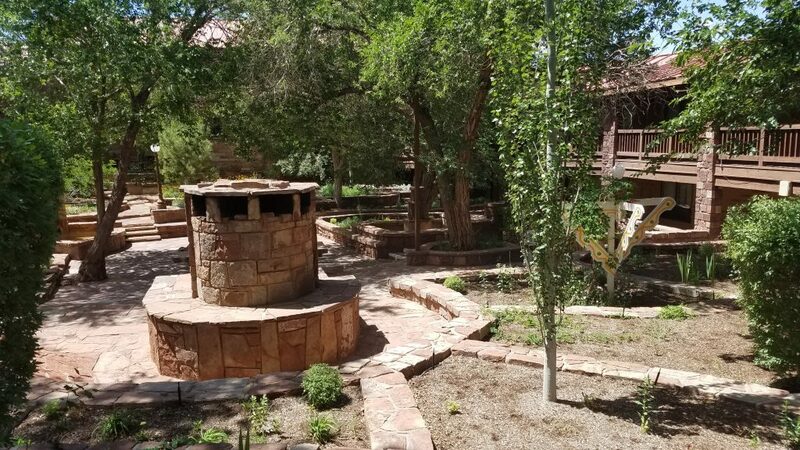 The trading post along with its adjacent gallery and hotel look like they would fit right in a national park given their their rustic stone architecture similar to the 1920s style of national park structures, also referred to as parkitecture. 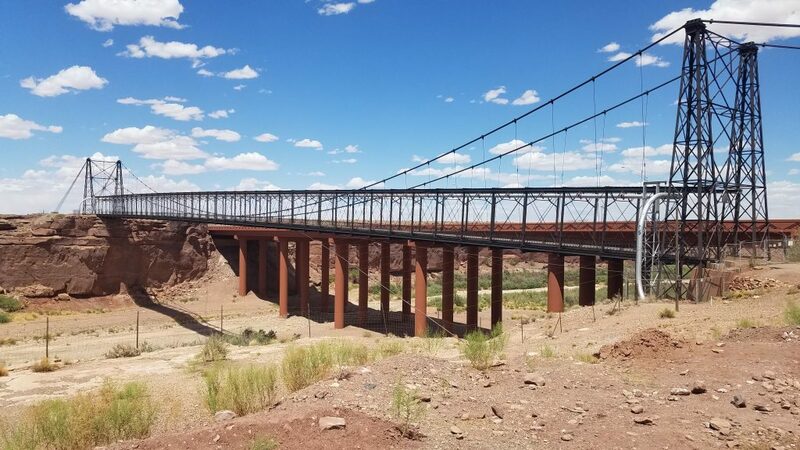 There might not have been a Cameron Trading Post if not for the suspension bridge, built in 1911, which now stands like a museum relic next to the still-bustling tourist center. Back then, the only inhabitants of the area were a few Navajo sheepherders living in hogans in the otherwise barren country. The one-lane, 14-feet wide, 660-feet long suspension bridge was the longest one west of the Mississippi River at the time. All materials for the bridge’s construction had to be hauled in by wagon from Flagstaff, 50 miles to the south. Names of some of the workmen can still be seen inscribed into the concrete supports underneath the bridge. 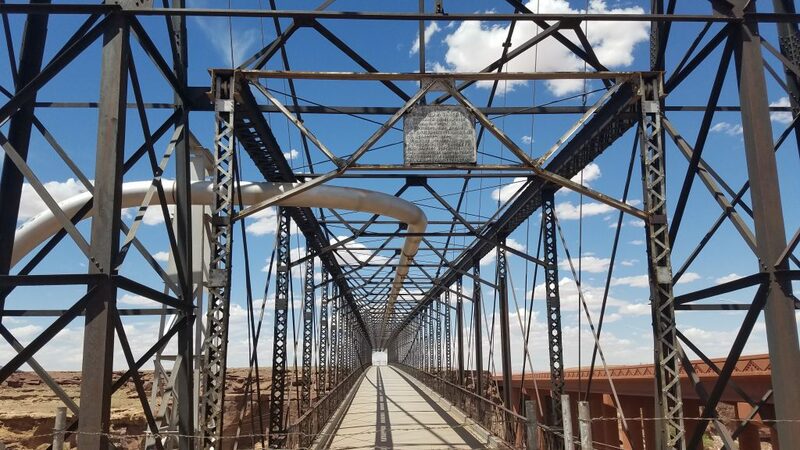 The bridge enabled travelers to bypass nearby Tanners Crossing, considered the safest crossing of the Little Colorado River by many groups for centuries, including Native Americans, Spanish explorers, mountain men, government surveyors, Mormon pioneers and others. The river nearly swallowed wagons and livestock during its regularly-occurring torrential flash floods. The bridge made travel through the area much easier. It was no longer necessary to descend into the Little Colorado’s narrow gorge, nearly impassable for much of its length. Five years after the bridge was built, brothers Hubert and C.D. Richardson claimed 112 acres and built a tin-roof shack on the south side of the river as a trading post. 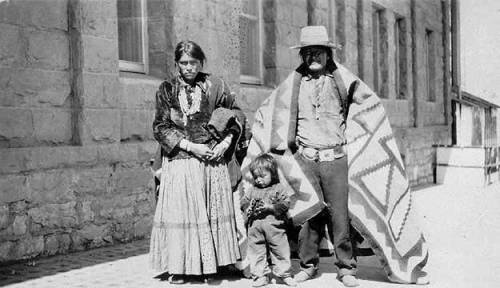 During the first years of business it served mainly Navajo and Hopi, who bartered their blankets, livestock and wool for dry goods. At times in the early days 1,200 to 1,700 head of sheep would be at the post waiting for shipment to Flagstaff or Winslow, Carolyn Davis wrote in her book about the Cameron Trading Post. In its first iteration, the trading post was a drafty store surrounded by four shacks for accommodations. At the time, a trip to the remote trading post could take days so the Richardsons housed many customers overnight over the years, treating them like family. 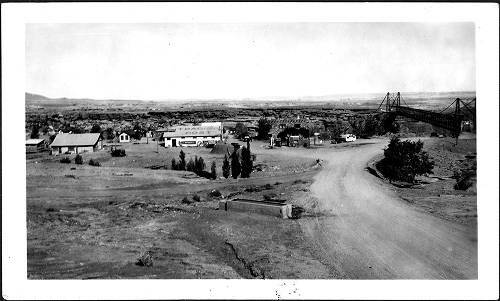 The trading post became a way-stop for anyone traveling through Northern Arizona. The Richardsons also understood local Native American dialects and customs and became vital in ensuring Native Americans understood American legal and social systems. 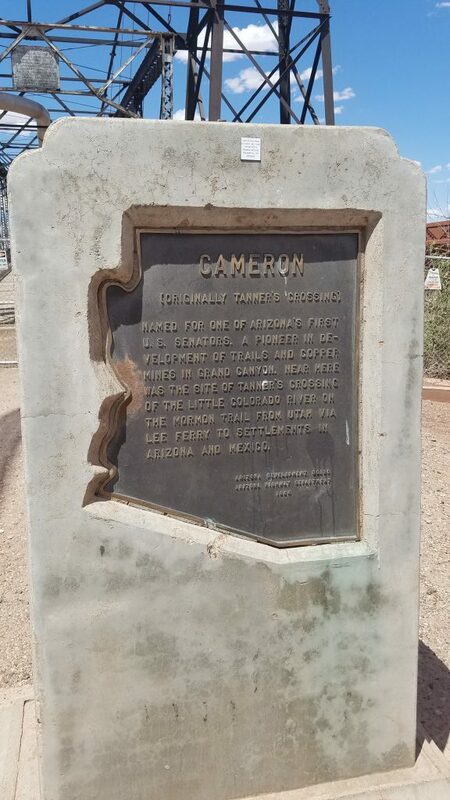 The post was first known as the Little Colorado Trading Post, but later the name was changed in honor of Arizona Sen. Ralph Cameron. Today the name seems an interesting choice since, to his credit, the senator helped develop Grand Canyon into a tourist attraction but on the other hand he literally felt he owned part of it – the Bright Angel Trail. He even lodged a legal complaint claiming he was entitled to charge tourists to use the trail even after the Grand Canyon was designated a national park. During World War I, Davis wrote, the trading post wasn’t the only building in Cameron because it was the site of a copper mining camp, which consisted of a huge warehouse and barn. 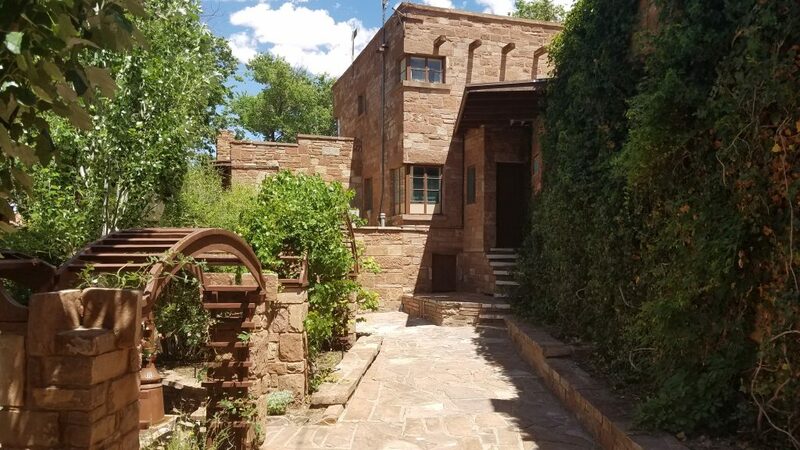 In the spring of 1928, Hubert Richardson built a pueblo-style hotel out of red stone that was called the Klo-a-chee-kin (Little Red House) Hotel. It included six upstairs rooms for guests as well as ground-floor lobby, kitchen, dining room and an apartment for its caretaker. 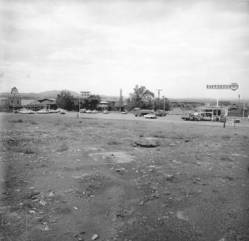 Once the hotel was built, Cameron became a more popular place and was noted for its luxury in such a remote location. It was decorated with Navajo rugs, baskets and pottery and the interior stonework included some stones that included dinosaur tracks. 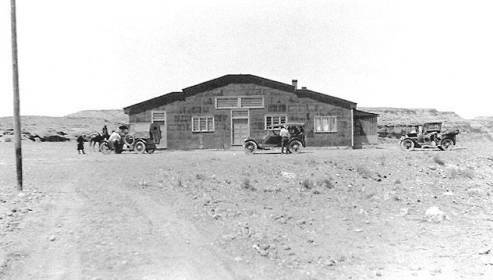 Additionally, there were a couple of hogans for Navajo guests (torn down in the 1930s for easier access to the gas pumps) and the number of cabins for tourists behind the store grew each year. An addition to the hotel, known as the Hopi building, was added in the 1930s. Cameron became a true oasis in more ways than one. It was the only supplier for miles around of two necessities for automobile travelers – gasoline and tires. It was a welcome respite during the challenge of traversing unpaved roads in sometimes-unreliable transportation. 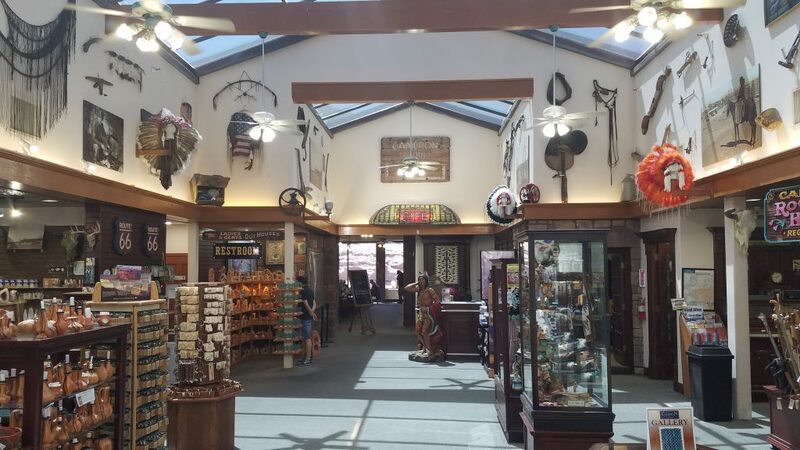 There have been many additions to the trading post over the years, including connecting some of the original buildings to form one building, such as the lobby between the actual trading post itself and the hotel guest check-in. Major additions occurred in the 1960s and 198os, administrative assistant and group manager Bernetta Jensen said, but one thing about all the buildings remained the same: its signature red rock exterior. They’ve tried hard to maintain all the buildings over the years, Jensen said, and have recently upgraded many of their rooms. The trading post lies at the southern boundary of the Navajo Nation. When first established in 1916, it was not part of the Navajo Reservation. The boundary moved several miles to the south in 1934 and, in 1940, a special act of Congress deeded the Richardsons the land the trading post sits on, Davis wrote. Because of this, the trading post is an independent business and not subject to Navajo tribal law, she noted. The business has stayed within the family over the years. C.D. Richardson’s grandnephew Joe Atkinson took over the lease in 1977 and formally purchased it in 1983. 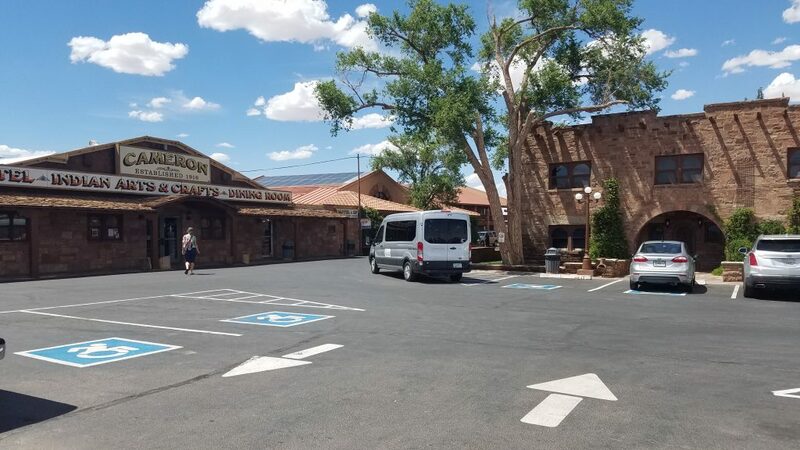 Movie stars ranging from John Wayne to Errol Flynn to Humphrey Bogart to Goldie Hawn have stayed at the motel while filming movies in northern Arizona. 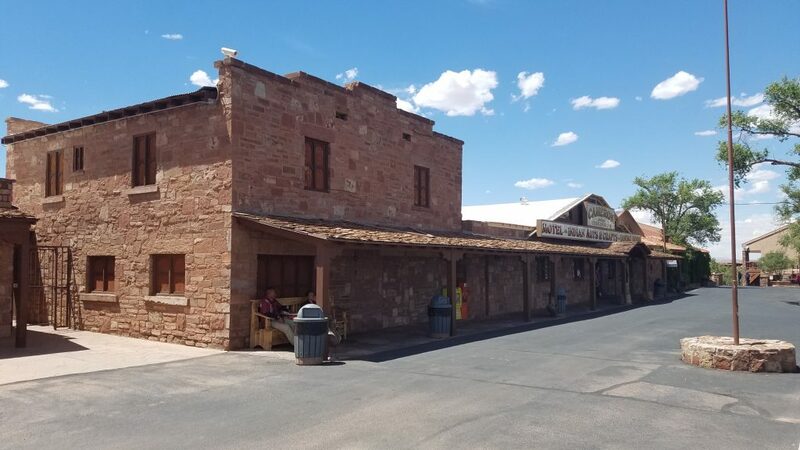 Famous western writers Zane Grey and Tony Hillerman set several scenes in their novels at the trading post. President Richard Nixon was marooned in Cameron during a snowstorm while he was a law student in the 1930s, Davis wrote, also reporting he held secret meetings there while president in the early 1970s. 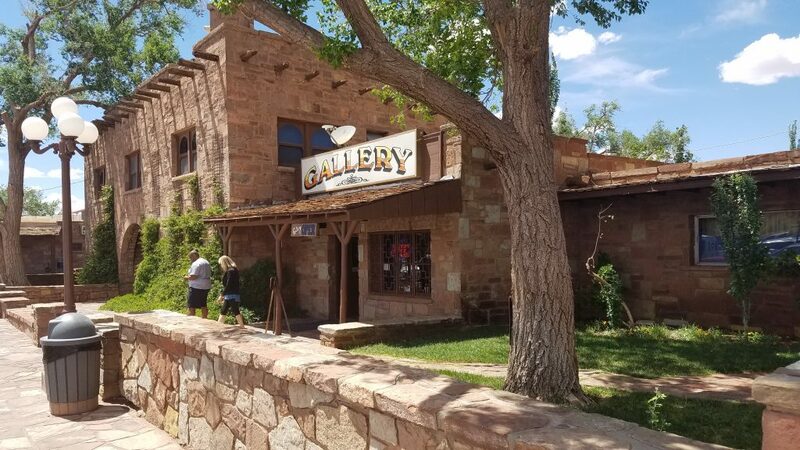 Just like the Navajo arts and crafts it proudly displays and sells, the history of the Cameron Trading Post is a tapestry of stories of many natives who have contributed to what it is today. Most of its staff is Navajo and Hopi who, Jensen said, treat each other like family. While nearby Grey Mountain just less than 10 miles south is basically dead, Cameron continues to thrive. Jensen said Cameron owes its success to the community that surrounds it, a good tourist base, the cultivation of good relationships as well as the exceptional food. “We try really hard to keep our customers happy” because, Jensen said, customers keep going where they’re treated well. Cameron is one of the last authentic trading posts remaining in the southwest. Today the whole complex boasts a grand gift shop, a restaurant, a 66-room hotel, an RV Park, a grocery store and a gas station. 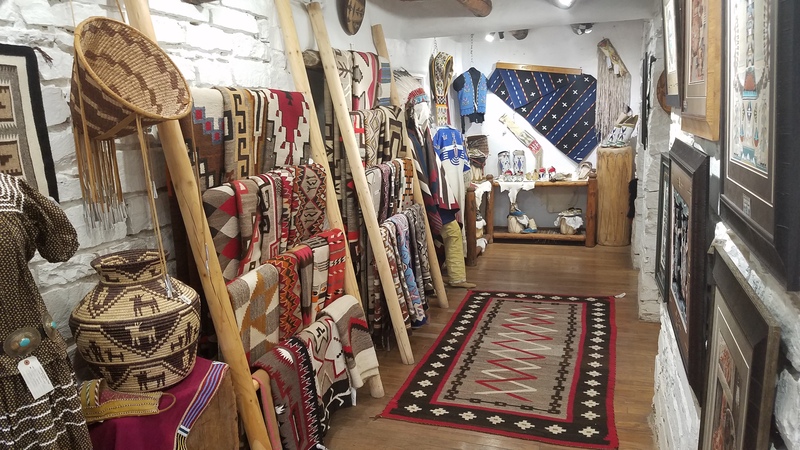 The trading post keeps it in the family as the current manager, Josh Atkinson, is the great grandnephew of the original founders; and Native American weavers and potters still come to the post to trade. Tour groups are often booked up to two years in advance and it is normal to see eight to 12 tour buses in the parking lot. It is a regular stop on the itineraries of many travel companies, Jensen said. 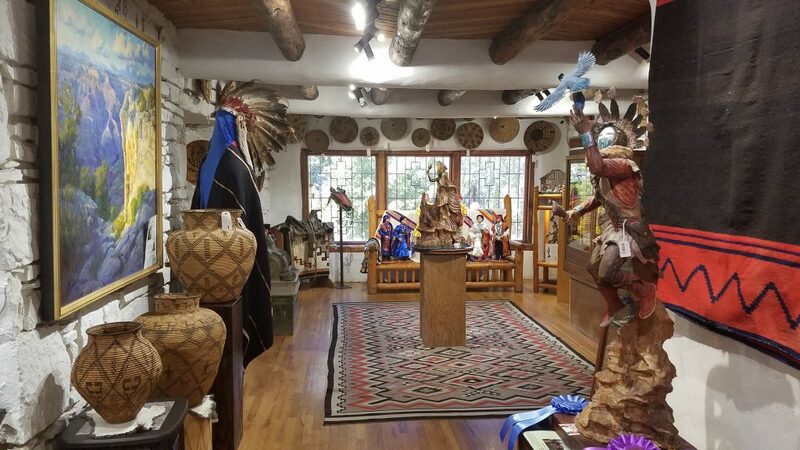 Visitors exploring even for a few minutes will see its allure – not only with its vast displays of Native American handiwork including its gallery of higher-end wares that was built in 1919. Two of its grand allures are its stonework and the inviting atmosphere of its garden courtyard, originally planted in the 1930s, which forms the centerpiece of its hotel. The Cameron Trading Post is just under four hours drive southeast of St. George via U.S. Highways 89-A and 89. It makes a great base camp for visiting other scenic and historic treasures in the area in addition to the Grand Canyon’s South Rim, Navajo National Monument, Wupatki National Monument, Sunset Crater National Monument, Lee’s Ferry and Glen Canyon National Recreation Area. For more information on the Cameron Trading Post, visit its website. The usual outstanding work of this local historian which we have come to expect. I laud his intensity and passion in developing these historic articles.